The myths about Sagittarius are a confused mix. In the 1st century BC, Eratosthenes, the Greek mathematician and author, identified Sagittarius as the satyr, Crotus. Crotus was the son of the goat-god, Pan, and Eupheme, nurse to the Muses. 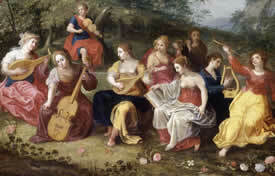 The Muses presided over the arts and sciences, inspiring culture and civilized behavior. Crotus was raised with them on Mt Helicon in the central part of Greece. Their home was near the fountains of Hippocrene and Aganippe which were created by the winged horse Pegasus. Like the centaurs, satyrs were known as wild, warring, lustful beasts, but Crotus was an exception. He was a peaceful soul with great musical talent who grew up to be a skilled hunter, superb rider, and inventor of the bow. He delighted in the company of the Muses and became their avid protector. In appreciation, when Crotus died the Muses asked Zeus to place him among the stars in a constellation equal to his extraordinary talents...the constellation Sagittarius. 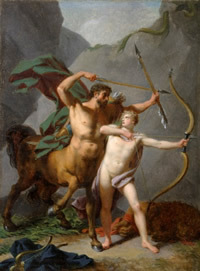 More recent authorities associate the stars of Sagittarius with the centaur, Chiron. However, in the 1st century AD the Roman poet, Ovid, wrote that the constellation Centaurus represented Chiron. And, Eratosthenes also pointed out that centaurs did not traditionally use bows. So, there is some dispute to the case for Chiron. Nevertheless, Chiron seems to be the most accepted association. Most authorities now consider Sagittarius to represent the civilized Chiron, and Centaurus to represent the rest of the Centaurs...the rowdy bunch. The Centaurs were notorious for being drunkards and carousers with a violent streak. But not Chiron. He was civilized and kind, a great healer and highly revered tutor of the Olympian heroes. One day there was a huge brawl with the other centaurs over some missing wine. In the melee, Hercules accidentally shot Chiron with one of his poison arrows. Ironically, Chiron had taught Hercules how to make them. At any rate, because Chiron was immortal, he could not die. And so, he was to suffer great agony for all eternity. It was only after Hercules brokered a deal with Zeus to allow Chiron to relinquish his immortality that Chiron was allowed to die. Zeus then placed him in the sky as the constellation Sagittarius. The formation of the constellation Sagittarius has the Centaur facing the great constellation of Orion, bow arched, arrow at the ready, aimed directly at the red star, Antares, the 'heart of the scorpion'. It is sometimes said that Sagittarius is protecting Orion from the Scorpion and at other times he is said to be protecting the Muses from the unwanted romantic advances of Orion. Like the other fire signs, the energy of Sagittarius is action oriented. 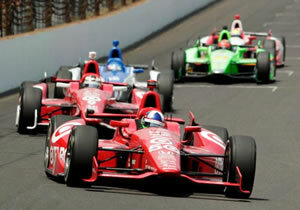 When planets travel through Sagittarius we want to put the pedal to the metal and Let's Go! Check the map later, we can eat on the way. Just don't fence me in! And don't ask for any committments either! Sagitarrius is a vagabond at heart. The impatience of the sign comes from a desire to know and experience everything the world has to offer...the cultures, the people, the philososphies. One way or another, Sagittarius will roam the countries of the world in order to gain the wisdom of the ancients. When planets transit Sagittarius, they stir us to open our minds and accept other ways of being and thinking. We become braver and more willing to take risks than we otherwise would. We become more outspoken about what we see and think. But while we gain intellectual understanding, there is not great deal of empathy for what anyone else is feeling. It's what they DO that counts! How many times have you heard 'it's the principle of the thing' ringing in your ears? That's Sagittarius speaking. And speak they do! They can sell you just about anything. An over abundance of Sagittarius energy, however, can lead to careless risk taking with little regard for others. Be careful what you wish for with Sagittarius, because you probably will get it. If you can harness this energy, it can take you around the world. Sagittarius is a large constellation of the southern hemisphere with rather faint stars. In the center of the constellation lies the asterism known as the Teapot, complete with a handle on the east side, the lid to the north, and spout to the west. 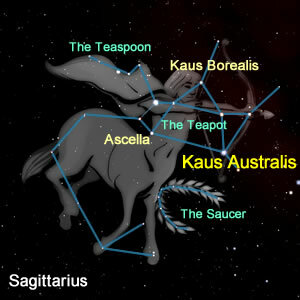 Its brightest star, Kaus Australis, marks the bottom right corner, where the spout connects to body of the Teapot. Sagittarius straddles the plane of the Milky Way galaxy. At it's very edge lies the Galactic Center, a huge black hole, discovered in 1932 by the scientist Karl Jansky while searching for the source of radio interference. Due to the effects of precession, the Galactic Center is gradually moving toward the constellation Capricorn. Sagittarius is the Latin word for Archer and things relating to arrows. Sagittarius, the Archer, can be seen low in the south from summer through fall in the Northern Hemisphere and during winter in the Southern Hemisphere.